Students used props to simulate sensory and mobility disabilities. As part of Cooper Hewitt Lab | Access Design Teen Program and the museum’s ongoing ‘Access+Ability’ exhibition (on view through September 3, 2018), the Design for Aging Committee of the American Institute of Architects (AIA), New York Chapter, was invited to facilitate a workshop with high school students to explore challenges experienced by seniors and people with disabilities. As an Accessibility Consultant here at Steven Winter Associates, Inc. and a member of the committee, I had the opportunity to attend the event. Students at the hands-on workshop were challenged to develop design solutions to address the needs of a hypothetical group of older adults attending a lecture on the 3rd floor of the Cooper Hewitt Museum. Included among the hypothetical attendees were people with visual, hearing, and motor disabilities and those with limited knowledge of the English language. What do you think of when you hear the term “healthy living?” A balanced diet? Physical activity? What about healthy building materials? The concept of healthy living can — and should — be extended to include anything that can affect people’s health either directly or indirectly. 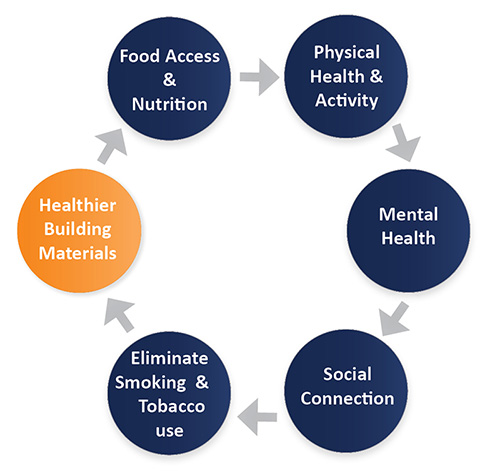 With this in mind, the impacts of building materials on occupants’ health is a growing concern of building industry professionals because exposure to unhealthy chemicals used in building materials can trigger serious health hazards. Katie negotiating a curb ramp and crosswalk with the aid of a cane while wearing vision-altering goggles. Last month, I had the opportunity to attend a training session entitled “Shifting Your Perspective: Experience and Plan for Accessibility Challenges,” which was hosted by the Dutchess County Planning Federation. The course syllabus was broken down into two components: experiential and site planning. The goal of the experiential portion of the course was to provide attendees with a variety of simulated sensory and ambulatory challenges and have them navigate the built environment. While the course was primarily geared toward local municipal planning boards, there were valuable lessons to take with me, both in my role as an Accessibility Specialist and as a county resident interested in learning first-hand the challenges that people with disabilities face every day.